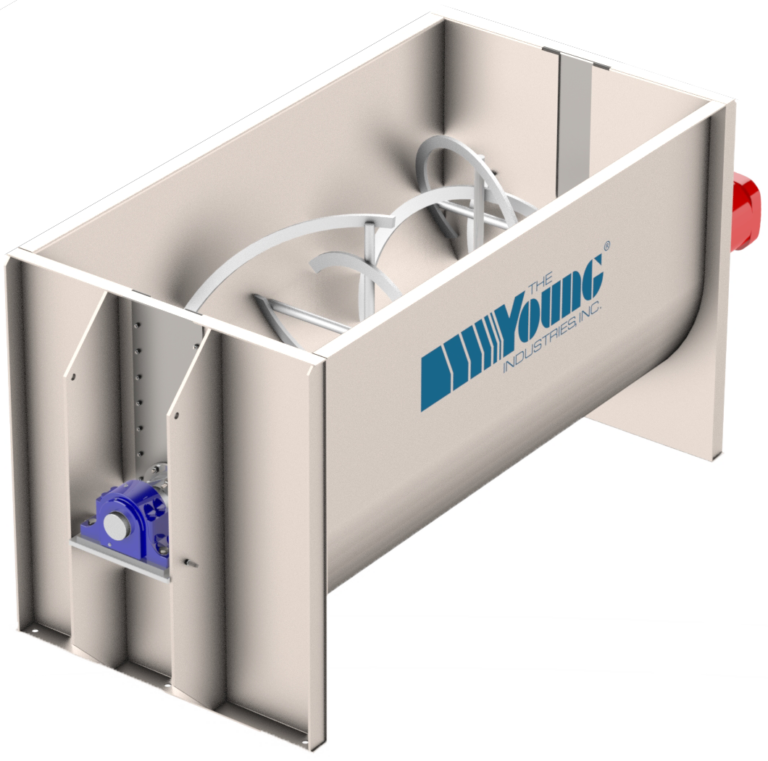 Horizontal Ribbon Mixer - The Young Industries, Inc. Thorough blending doesn’t have to waste power. Our horizontal mixers give you a precise match of horsepower-to-load requirements. We ensure the motor is accurately sized for energy efficiency by taking the time to analyze your product, process, and capacity needs. The same holds true for the rest of the machine as well. You get exactly the features you want! We offer sizes from 0.25 cu. ft. to 1500 cu. ft.; in configurations from standard, to short, to long and trough designs from “U”, to cylindrical, to obround. Our mixers can be directly scaled up based on testing results because of our agitator design. Several types of agitators are available; multi-pitch, standard double ribbon, paddle and trowel. Mixer bodies are supplied with either slotted ends, removable ends, or fixed ends to meet customers requirement for agitator removal. All mixers are custom designed to meet customer requirements. Agitator and drive calculations are performed to ensure trouble free operation for many years. High/low pressure and temperature designs are not a problem. Size = Working Capacity Example: Less than 5 cu. ft. is considered a lab mixer. Heavy Duty Design – Trough, Ends and Ribbon thickness are greater than our competitors. Mixer incorporates a 1/4” drop center design for tighter clearance and better cleanout. All gear reducers selected are designed to AGMA Class 2 gearing requirements. Which specifies a minimum 1.4 SF. Prior to shipping, the mixer is completely assembled and run tested. Mixers are shipped completely assembled unless customer requests that the drive be removed. Finally, Young Industries has 70 years experience in mixing applications and equipment design. All agitator types have at least one thing in common; the outer ribbon/paddle conveys material towards the discharge and the inner ribbon/paddle conveys material away from the discharge. Used when mixing multi-ingredient batches with small percentage of materials, strict homogeneous mix is required, and/or mix time is critical. Used when a gentle mixing action is required and mixing time is not a factor. Used when mixing ingredients that contain shortening or other soft agglomerates. 0.5 thru 5.0 cu. ft.
10 thru 150 cu. ft.
200 thru 650 cu. ft. Warning Some machines in this section are shown with guards or covers removed for the purpose of illustration. Machines must not be operated with guards, covers, or other protective devices removed or disabled.